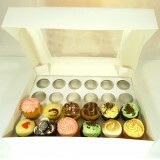 - Ideal for weddings parties and celebrations, for cupcakes and buffet food. - The stand will hold around 40 cupcakes depending on the cupcake dimensions. The distance between each tier is 110mm and the total height of the stand is 360mm. 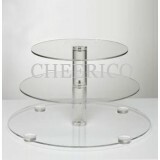 This Cake Stand is Fully Adjustable, it will arrive to you flat packed in a box ready to be assembled.